Endura have launched a video to encourage citizens around the globe to ditch their cars and ride to work. Highlighting the health and environmental benefits as well as time and money savings to be made, the Scottish company aims to spread the message wide and far to get more people onto their bikes. In big cities like Berlin, Paris, Barcelona, or New York, millions of commuters are stuck in heavy traffic every day. In London alone, roughly 4 million people commute to work. With the average traffic speed well below 16 miles per hour, they spend up to 1.5 hours on their quest to get to work. However, there is a different way: around 80,000 Londoners currently choose to beat the rush by using their bike, and thereby choose to be faster, fitter, smarter, and healthier. They are more productive at work, and they get to spend more time out of work. On only a six-mile commute, you can burn up to 500 calories as well as reducing your carbon footprint by almost half a ton per year, the equivalent of a transatlantic flight. The message is clear: Choose Life, Choose Bike. Pamela Barclay, Endura’s brand director, said: “If Endura can play a small part in assisting the revolution that is sweeping through cities across the world then we’ll be delighted. Many of our employees have abandoned their cars and cycle to work at our HQ near Edinburgh, go for lunch break rides, and are involved in our internal product testing. The brand’s no-nonsense commitment to advancing the performance and function of cycle apparel extends across all their tribes, MTB, Road, Triathlon, Adventure and A2B. From super high-viz kit to keep cyclists visible and safe in traffic, to more subtle urban styles that move effortlessly from the bike to the office or café, Endura has been making cycle commuter’s journeys safer and more comfortable for many years. Reversible, insulating jackets like the Urban PrimaLoft Flipjak or the Hummvee Shacket keep cyclists warm in a casual, office-compatible style, while waterproof garments like the Urban Luminite Jacket and Pants protect commuters from the elements and keep them visible on the roads. Endura’s A2B offer not only boasts a wide selection of jackets and legwear, it includes head to toe outfits, from helmets, gloves, and overshoes to warmers, socks, luggage, and eyewear. Worn down by your daily commute by car or on public transport? 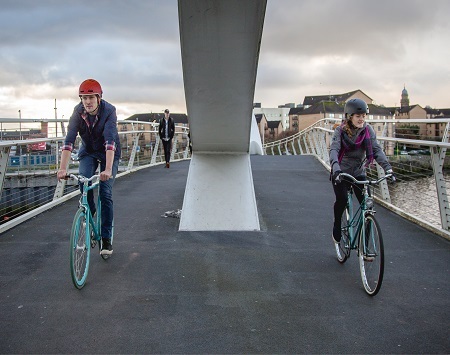 Why not embrace riding to work by bike? In big metropolises around the world, millions of commuters are stuck in heavy traffic every day. However, tomorrow could be different: around 80,000 Londoners already choose to beat the rush by taking their bike. They choose to be faster, fitter, smarter, and healthier - and you can, too!